The Swedish team Artemis and the Italian Azzurra squad both won thrilling matches on Thursday at the Louis Vuitton Trophy - Auckland, to advance to the semi-finals and dispatch their opponents out of the regatta. Artemis came from behind to beat Britain’s TEAMORIGIN while Azzurra landed a penalty on the German/French boat All4One and led all the way around the race course. 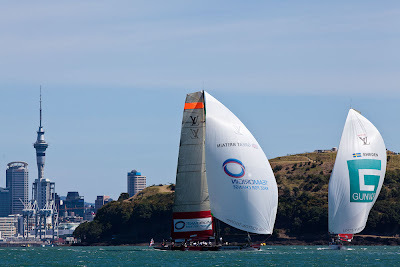 Each pair in this elimination round were slated to race a best-of-three series but flat calm conditions on the Waitemata Harbour forced a change of plans to sudden-death single races for both pairs. 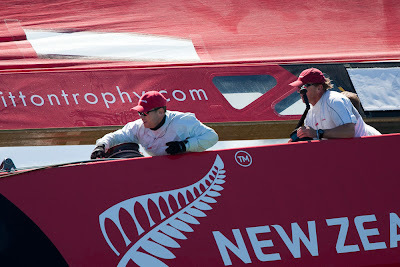 The semi-finals on Friday will see Emirates Team New Zealand, top of the table at the end of the Round Robin, face Azzurra after ETNZ skipper Dean Barker selected the Italian team as his opponent. That leaves Mascalzone Latino Audi Team against Artemis. The winner of each ‘first to two points’ series will advance to the final. Barker said it was always tough choosing an opponent, but he went with Azzurra, the team who triumphed over the Kiwis in the final of the last Louis Vuitton Trophy event in Nice. “We know the guys well and maybe we will get a little bit of revenge hopefully for Nice. We always have good races against those guys,” he said. Azzurra skipper Francesco Bruni said he was confident going up against the home team, who may have a perceived advantage in stronger breezes and their own boats – especially after Azzurra’s victory over All4One today. The Swedish Artemis team is rounding into form at the right time and enters the semi-finals with confidence. Racing is scheduled to start with a warning signal at 10:00 on Friday morning. The forecast is for fresh conditions. Azzura went on to lead across the line clear ahead and luffed up momentarily to gain weather gauge. Still bow ahead and to weather, she took the German/French boat out to the exclusion zone on the left side of the course and maintained her lead through eight short tacks. The margin was nine seconds at the mark. Col overtook to weather on the run but as they both overstood the layline for the leeward gate and went to douse their gennakers, the All4One gennaker went under the boat, spelling the end of her challenge to the Italians. All4One joins TEAMORIGIN on the sidelines. 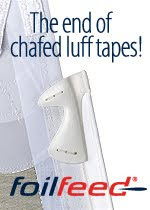 LIVE Sport Sailing 103.0 FM is featuring all-day live coverage of the Louis Vuitton Trophy. During the elimination rounds Television New Zealand’s TV1 is featuring nightly half-hour reports. 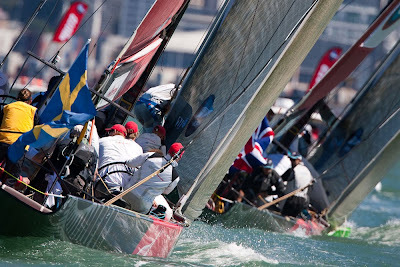 For the finals on 20th and 21st March there will be live coverage of the racing from noon to 4:00pm.